Published by Wiley Nautical and written by a successful Laser Radial sailor, this book starts off with a good pedigree. As should be expected from a Wiley Nautical practical guide and manual, this is a lavishly illustrated book, making use of full colour through the body of the book. The author has written in an easy style that demonstrates a firm understanding of his subject. 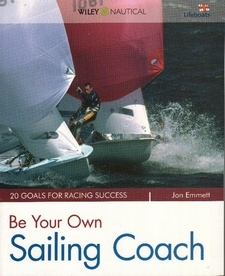 There are a great many books that aim to teach sailing skills and competition skills. Of these books, most are written by authors who have a direct practical experience, either of sailing, or of boat design and construction. The result is that they frequently concentrate on one aspect of the skills required and then provide less convincing information on the remaining and equally important areas. In this book, the author has taken a simple and effective approach by providing a goal-based instruction. This means that the basics of boat handling and preparation combine with tactics and strategy for competition, but also address weather and wind forecasting, mental attitude, fitness and diet, all in equal measure.